Triple S was awarded the MedAssets Supply Chain Platinum Supplier Award at the MedAssets Healthcare Business Summit in Las Vegas, NV, April 26 –28, 2016. Triple S was recently awarded the MedAssets Supply Chain Platinum Supplier Award. This is the highest tier of award given for supplier excellence. 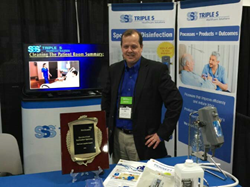 The award was accepted by Russ Ede, Triple S Director of National Accounts, at the MedAssets Healthcare Business Summit in Las Vegas, NV, April 26 –28, 2016. The summit was attended by over 3,800 industry thought leaders from across the country. The Platinum award level is only granted to suppliers who rank in the highest categories of partnership, support and social responsibility. Some areas of consideration are market leading value, support of key business objectives, and environmentally responsible business practices. “We appreciate the national recognition of this prestigious award from MedAssets,” Russ Ede said upon receiving the award, “We look forward to continuing our relationship as a Supplier partner in the new partnership between Vizient and MedAssets going forward”. About Triple S: Established in 1960, Triple S is a national distribution services and logistics company that provides facility maintenance solutions to the healthcare, education, commercial, retail, government and building services contractor markets. Local service and support solutions are made available through a network of Member-Distributors and regional distribution centers. For more information please visit http://www.triple-s.com. About MedAssets: MedAssets is a group purchasing organization that focuses on helping providers realize financial gains so they can sustainably meet the needs of their community. Based in Alpharetta, GA, their membership includes over 180 health systems, 4,500 hospitals and 123,000 non-acute healthcare providers, as well as payers and healthcare IT vendors.